The Frigidaire FAD251NTD is a compact portable dehumidifier for smaller areas of your home. It is certified by Energy Star®, is a fairly light appliance and will fit into a room where space is tight. Models in this class are usually used in areas such as bedrooms and bathrooms and are not powerful enough for anything but the smallest basement. It has always been popular with users and most reviews have been positive. This model is no longer in production. In its place the manufacturer has introduced a new 30 pint model, the FAD301NUD. New examples of the 25 pint unit are now almost impossible to find but there are some pre-used units available. Although these will be cheaper to buy than the FAD301NUD the new model is as effective and more energy efficient so may be a better choice. The information posted here is intended as a reference for any of you who may be considering a pre-used example and need details of its specifications or a copy of the manual. I have also included a brief summary of consumer experiences of this model and my recommendations. This model is fairly light and compact. Carrying handles are fitted and the unit is mounted on casters so it is easy to move from room to room. The unit works best at a temperature of 65°F or above. Auto-defrost protects the unit from damage caused by ice formation on the cold coil in cooler conditions. The humidistat senses changes in humidity and cycles the appliance on and off to keep moisture at the level you select. You have a choice of relying on the water collection bucket and emptying it every day or attaching a hose to the appliance and allowing the water to run continuously to a nearby drain. The appliance is controlled using a manual dial and switches. Although less "sophisticated" than electronic controls these are easy to use and less likely to fail. The filter, which should be cleaned about once every two weeks, protects the appliance and will also capture some of the harmful bacteria carried in the air. This lets you know when the bucket is full and needs to be emptied. If you don't notice that the tank is full this system automatically shuts down the appliance to prevent water over-flowing from the bucket. Small dehumidifiers are less popular than larger models so the number of reviews of this model has always been limited. Most of the reviews that have been published are positive. Users say that this appliance is easy to operate. They also report that it is effective in the smaller areas for which it was designed. This model has been found to be reliable by most users. I would not now recommend the FAD251NTD as a new purchase if it was available. The new 30 pint FAD301NUD is around 17% more energy efficient (Energy Factor 1.4 vs. 1.2 for the FAD251NTD). 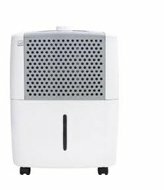 The FAD251NTD is still a decent small dehumidifier so if you are looking for a used example in good condition, and the price is right, there is no reason not to buy. Bear in mind that even the best portables have become "throw away" items in recent years. The sad truth is that a model that lasts longer than two years is becoming the exception and repairs, if you can find anyone to do them, are usually too expensive to be worthwhile. You may like to take a look at the new model by following this link to my review of the Frigidaire FAD301NUD.